Not that I don't appreciate good musics from the early days of Rock n Roll but when I am in my office and sobered up from the rocking gastronomic experience which one would experience if one stays in a hotel where rock memorabilia is the order of the day, reality hits home. I was and actually still an avid fan of rock n' roll music and being close to all the memorabilia especially those in my teen age, it makes me wanna rip those showy guitar of the wall and rip some rift (not that I know how to play one). 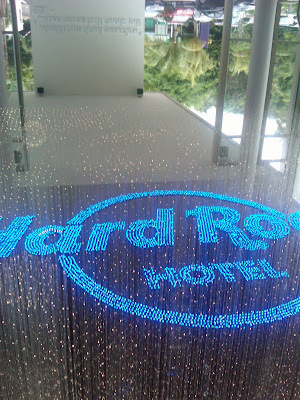 Anyway, as I was trudging the hallowed hall of Hard Rock Hotel in Penang, (although new, the memorabilia is authenticated from legends) I bombarded the crew (the staff is called as such) there with rock trivia just to see how trained were they. I found myself to be very old with their answer. Most of them don't know the band which I am so in love with long ago like Guns n Roses, Nirvana and Bon Jovi. Don't let me start on how they have never even heard the songs of the Cure, Rolling Stones and Aerosmiths. The only one which transcend the age limit is Green Day who seems to have a second revival of sort with their current albums and was famous for Nookie during my time.